We appreciate the time that our three generous judges took to review the entries in their genre and then to select the grand prize winner. Creative Nonfiction judge Jill Christman’s memoir, Darkroom: A Family Exposure, won the 2001 AWP Award Series in Creative Nonfiction and in 2011 was reissued in paperback by the University of Georgia Press. Her first e-book, Borrowed Babies: The Science of Motherhood, was released from Shebooks in Summer 2014. Recent essays have appeared in Fourth Genre, Brevity, River Teeth, Iron Horse Literary Review, and Brain, Child, as well as many other journals, magazines, and anthologies. She is an Associate Professor of English in Ball State University’s Creative Writing Program and teaches creative nonfiction in Ashland University’s low-residency MFA program (where she is also a regular presenter at the River Teeth Nonfiction Conference). In 2013, Jill was elected to the Board of Directors of The Association of Writers & Writing Programs (AWP) and is currently serving as the Midwest Representative. She lives in Muncie with her husband, writer Mark Neely, and their two children. Poetry judge Mark Neely is the author of Beasts of the Hill (winner of the FIELD Poetry Prize) and Dirty Bomb (2015), both from Oberlin College Press. His chapbook, Four of a Kind, was published by Concrete Wolf Press and his poems have appeared in many anthologies and magazines, including Gulf Coast, Indiana Review, Boulevard, Willow Springs, and Barrow Street. He is an Associate Professor of English at Ball State University in Muncie, Indiana, and the editor of The Broken Plate. Fiction judge Rachel Basch is the author of three novels. The Passion of Reverend Nash (W.W. Norton) was named one of the five best novels of 2003 by The Christian Science Monitor. Degrees of Love (W.W. Norton, Harper Paperbacks) was translated into Dutch and German and was a selection of The Hartford Courant’s Book Club. Basch has reviewed books for The Washington Post Book World, and her nonfiction has appeared in n+1, Parenting, and The Huffington Post. Basch was a 2011 MacDowell Colony Fellow. She received the William Van Wert fiction prize for an excerpt from her new novel, The Listener, which was published by Pegasus Books in 2015.She teaches in Fairfield University’s MFA Program and in the Graduate Liberal Studies Program at Wesleyan University. The poetry and prose pieces that we selected this year all seem to wrestle with the nature of human weakness and strength, from the sympathetic Satan of Paradise Lost to a Pennsylvania serial killer to a wayward search for a composition instructor. Our poetry ranges beyond the margin and the line break, and we feature here some of the longest and most experimental choices from my tenure as editor. And we chose two poems titled “The Accident” which seem to have a conversation with each other. We had a fantastic range of submissions to choose from, and as always, the final decisions were never easy. Once we reached the final pool of about 20 to 30 pieces for each genre, we came to see that we had more than enough material for two good issues. Beyond that final pool, the choices were somewhat agonizing. I wanted to take this opportunity to thank everyone who sent us their work. Being in the position of editor has allowed me to appreciate the persistence and talent of writers who challenge and surprise themselves and their readers. Our grand-prize winner, Daisy Hernández’s essay “Los Ojos,” came in through the submission manager and was selected anonymously. The student editors and I were immediately drawn to her vivid multi-generational story and direct yet reflective prose. It’s always a thrill to read our author bios after we’ve selected the winner, and it was particularly exciting this year to see that Hernandez was an author whose celebrated new memoir, A Cup of Water Under My Bed, is one I have enjoyed and admired. I’ll be handing over the reins of Dogwood after this issue to Carol Ann Davis, our current poetry editor, who teaches along with me at Fairfield University. She and future students will, I’m sure, do fantastic things with the journal and guide it ably as it evolves. As I seem to write in every editor’s note, the most enjoyable part of producing Dogwood has been working with my students. As they sharpen their editorial opinions and their sense for the semi-colon, they grow as writers and readers, getting an inside and collaborative view of the way literature is, in practice, brought into the world. There’s nothing else quite like the urgency of working with a literary author to negotiate the balance between house style and his or her own sense of what needs to be said and how to say it. This conversation opens the way for a new sensitivity in my students to the nuances and the power of the written word, and the way in which printed texts hide the tracks of conversations and questions. Dogwood is once again available in digital form through LitRagger, an iTunes app that allows readers to download our issue along with a large family of other literary journals. We continue to offer the print annual for sale, and you can now pay for a single copy or subscribe via PayPal at our website. Thanks for reading. As always, we love to hear from readers. If you have comments, please email me at shuber@fairfield.edu or find us online at Dogwoodliterary.com. 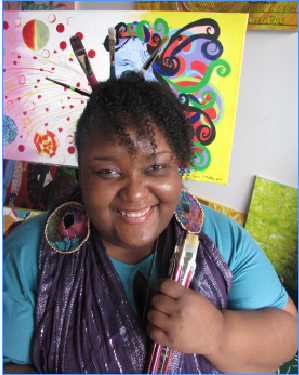 Shanna Melton is a poet, painter, and art consultant from Bridgeport, Connecticut. She currently serves as the Ambassador of Poetry at Housatonic Community College. Shanna has performed in poetry venues from Atlanta through Canada. As the Ambassador of Poetry, Shanna curates many poetry events which present local and international artistry to the Bridgeport community. In the summer of 2013 and 2014, she brought excellent poets together for The Poem Mobile, sponsored by Housatonic Community College and City Lore. Shanna also organizes the Writer’s Group and was the founder of Lyrical Voices Night of Poetry and Arts. She is also the author of the poetry collection entitled “A Voice in the Symphony.” In January 2011 she was presented with a citation from the State of Connecticut through Bridgeport’s Black Pride with the Women to Know Award, given to people who create positive change in their community in line with the vision of Dr. Martin Luther King, Jr. She has exhibited her paintings in many venues through the tri-state area including the Barnum Museum and the Margaret E. Morton City Hall Annex in Bridgeport for the 2014 Black History Month Celebration. Her paintings are also featured in a documentary and play by Tantra~Zawadi.